Paul Maheke, To Read the Wavering of the Swarm, 2016, digital printing on fabric, installation view. Today’s show: “No Ordinary Love” is on view at Galerie Sultana in Paris through Friday, September 9. The group exhibition presents work by Jesse Darling, Celia Hempton, Paul Maheke, Sojourner Truth Parsons, and Dardan Zhegrova. 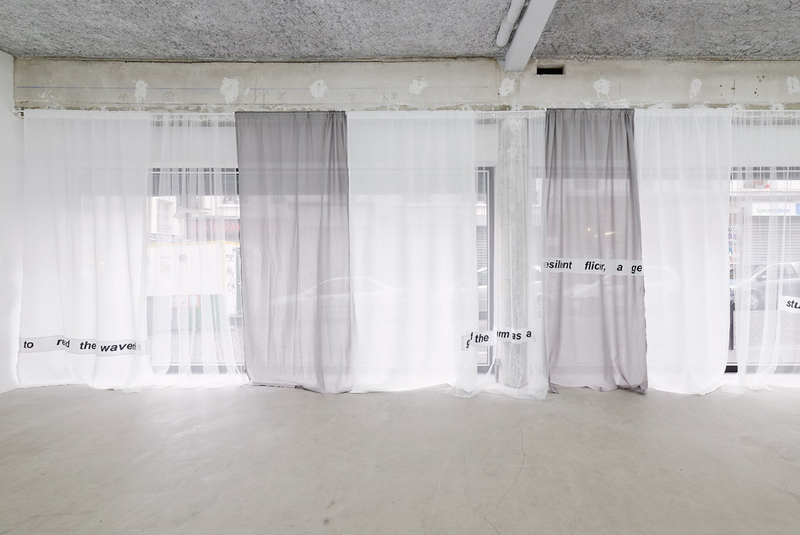 Installation view of “No Ordinary Love,” 2016, at Galerie Sultana, Paris. Installation view of “No Ordinary Love,” 2016, showing work by Dardan Zhegrova and Jesse Darlin, at Galerie Sultana, Paris. Installation view of “No Ordinary Love,” 2016, showing work by Paul Maheke and Jesse Darling, at Galerie Sultana, Paris. Celia Hempton, bulgaria 25th november 2015, 2015, oil on linen. Celia Hempton, Eddie, 2016, oil on polyester. Celia Hempton, Unknown (video loop) russia, 22nd october 2015, 2015, oil on polyester. Sojourner Truth Parsons, The same rope that pulls you up will hang you his and hers edition II,2016, collaged canvas, acrylic, sand, and glitter.